I would iron dish towels, sheets, and underwear. I would sell all of our surplus china, pizza stones, pots, and vases. We have too many as it is. The ones under the bed really need another home. I would never check the mail. Period. I would make everything from scratch. Everything! Bread, crushed tomatoes, pasta, soap, lotion. Everything. I would vacuum and mop the whole house every day. I obsessively flatten the dish towels with my hands, and stretch the sheets so tight they look ironed. I keep the comforter hanging as low as possible so I don’t have to see the mess under the bed. I give the mail a quick glance, but then it all just goes into the designated mail box to rot. I never go back to it. Ever. I make sauce from scratch in the summer and freeze it all winter. The rest I buy. I vacuum and Swiffer the kitchen every afternoon, when PB can’t see me singing and dancing to the Glee soundtrack. If I really did what I wanted, I would run every single morning. For now I have to settle for boot camp, yoga, swimming, biking and walking. I can’t wait to run again!!!! Haha you are a nut! I like this one. Hahah I love this. 😉 I wish I could make everything from scratch, too! You would along so well with my mom. She’s obsessed with ironing! If I really did what I wanted, I would blog for a living and kiss corporate America GOODBYE! agreed to all! i love ironing. there is something about watching the wrinkles fade that is so therapeutic to me! I absolutely love this post!! I feel like you could write so much more about each of these topics. Also – congrats on 1000 twitter followers, I had fun watching the fitblog chat last night although I was a little intimidated to join it was nice to read. I will not iron. It’s tragic because I bliss out over a crisp men’s button down but I must have an iron allergy. Similar to your mail allergy (which I also share). But the make it ALL from scratch, endorphin rush every morning? 100%. Right now I’m more concerned that my bathroom was made from a former pantry but when I have REAL space….deep freezer. Need something to hold my frozen summer treasures all year long. Cute post. You’re positively perfect, Sabrina! Fun list! If only we could do everything we wanted all the time! Love the idea of making everything homemade. And yup, nothing in life better than ironed sheets! ditto…seriously…except for the Swiffering part. I run out of time at the end of the day. You should pay more attention to Fight Club next time I am watching a rerun of it, my dear…. If I did what I would want; I would have the courage to turn “professional” in running…. Ummm..Phily Boy’s response is insane btw!Lol. I would love to run every day and make everything from scratch! Maybe not the lotion and soap….but definitely the food. If I had things the way I wanted the house would never require cleaning becuase it would clean itself! I don’t like ironing or mopping (am also awful at both) but I agree with everything else! Hehe i love this post 🙂 I hope you heal quickly!!! Haha! 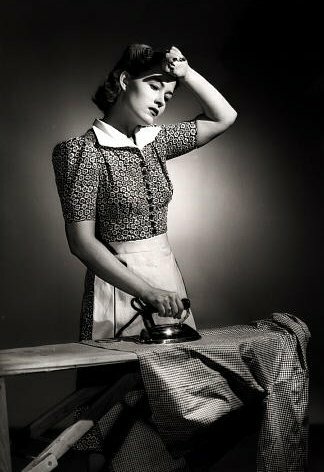 I was laughing when I read your post because I NEVER want to iron. I’m all about hanging things in the bathroom while I take a hot shower. If I had it my way I’d have plenty of time to take the dog for long walks, workout whenever I wanted and always have 1+ to make dinner while enjoying a glass of wine. Wow! That all sounds really good right now. Have a great night! “I give the mail a quick glance, but then it all just goes into the designated mail box to rot. I never go back to it. Ever.” HAHA seriously, story of my freakin’ life. I have a problem. I hate dealing with mail!! Also, I loved your post on The Fitnessista! Great advice!